“Remember who you are. All those people who worked and sacrificed for you to be where you are, when you walk out this door. You carry with you the mantle of responsibility-the good name of this family, the hopes and dreams of your Mom and Dad. Remember the promise that is yours, the opportunities that are in front of you and the hope that is in you for a better world.” I wonder if the next line would have been- and you better get it right because if you don’t remember, you don’t love us and it all depends on you. It’s possible to hear Jesus’ farewell words this way- “if you love me, you will keep my commandments.” Remember. It’s hard to remember this when we’re just getting through the day, but harder still when it’s getting through each day when they’re gone. How will we remember? What will it mean if we can’t keep all that you told us? Perhaps we think of this in our nation, this Memorial Day weekend, we’re remembering those who fought and sacrificed for us to be where we are as a nation, while struggling to remember that Memorial Day is not first and foremost about sales at the stores, or picnics, though we can do those things too because of the sacrifices of others. Some worry that we as a country no longer remember the wars of another time and what we learned from them. What if we aren’t good at keeping the memory alive? Remembering is about more than ritual. It’s about what is in our hearts. It’s what each of us lives out when we try to hold on those we’ve loved who are now departed from this life. We hold them dear in different ways and times, hoping we’re not alone, that they’re somehow still with us. In my husband’s family, we hold dear my late father-in-law whose birthday is next week and whose favorite pastime was watching horse races, especially the Triple Crown races- the Kentucky Derby, the Preakness and the Belmont. All family events and meals were planned around when these races were televised. All conversation stopped when the horses were loaded into the gates. He always had some crazy way of picking who he thought would win. After studying the racing sheets, it usually was the name, or the jockey or some other inner voice that he relied on. Often he was right. Even now we find ourselves trying to imagine which horse he would have picked; which grandchild has said or done something that reminds us of him. We tell stories, and imagine what he might say about events in the family or the neighborhood. It’ll be eighteen years this fall that he died. Still each spring, his three children take turns putting flowers on his grave for the races- Red Roses for the Derby; Black Eyed Susans for the Preakness and White Carnations for the Belmont. Because he asked us to. 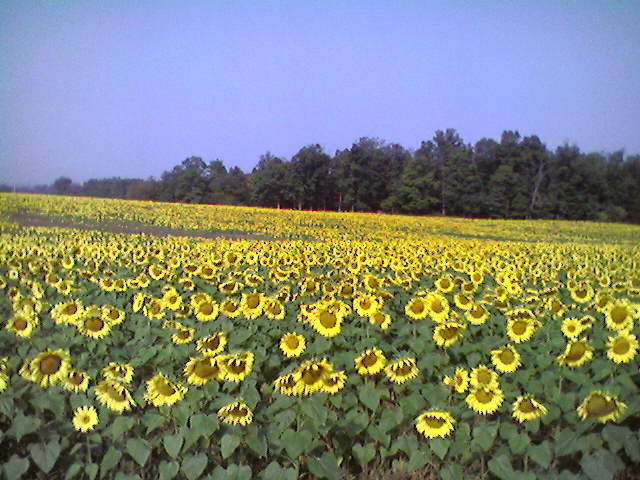 Our race is the Preakness- black eyed susans, the Maryland state flower. The winner is draped with a blanket of them after the race. Every year I’ve struggled to find black eyed susans. I never do, so I end up trying to do something that’s as close as I can get. One year I couldn’t even find nice yellow daisies. I ended up getting silk ones and coloring in the centers with a black permanent marker, one by one. To honor his words. It was only much later that I learned that the blanket of flowers the Preakness uses really isn’t made of black eyed susans. They’re daisies with their centers painted because while everyone wants to honor the state flower, they can’t be ready in June. So much for keeping the letter of the law, but we try. But no matter what we do, we can’t bring back a real sense of my father in law with us, just a memory. For my mother in law, who’s lost both parents and her spouse, it’s can be hard not to feel orphaned and alone, wondering why the world doesn’t see things the way you do. Keeping memories alive is hard. But Jesus’ words to the disciples and to us remind us that Jesus isn’t only a memory, but a living presence. Although Jesus departs from the physical presence of the disciples, Jesus is not dead, but living. And we’re asked to do more than keep rules, but hold Christ alive in our hearts. It’s ultimately about more than ritual, it’s about ongoing living love, embracing God in our very being. It takes more than we can produce. Enter the Advocate. The purpose of God sending the Advocate isn’t about demanding ritual, it’s about love. God sends the Advocate out of love for us, knowing it’s hard for us to remain faithful and stay true when we feel alone and at odds with the world. God sends the Advocate, literally as “one who walks beside” so that we continue to see what Jesus first revealed- God’s purposes, God’s power and God’s love. So that we can remember more than who we are, we can remember WHOSE we are. So we can begin to believe what that means for our lives. By the Spirit, we not only see Jesus, but Jesus dwells in our hearts. God’s love is sent to us by the power of that Advocate, to move our hearts to connect to God’s. The Advocate walking beside us brings this awareness of this blessing and this challenge. Perhaps it is borne out of my own experience, but the best way I see the Advocate is like being the Mother of teenagers. I have two in my house right now. It’s hard to send them out to experience life, occasionally learning things the hard way. I hope that they remember the ways they were raised. Along the way, sometimes I’m there to comfort them, to offer guidance, stand up for them, listen when they need to vent, to talk to their Father when they have a need or a problem, to offer hugs. Other times I need to give them a push, set a limit, or tell them they are flat out wrong. I am both thrilled to see who they are becoming and sometimes really frustrated when I see how they treat each other or others they meet. I want to scream “Remember who you are!” But no matter what, out of love, they are mine. And it’s more important that they remember I’ve got their back, reminding them- you'll never walk alone. God’s love made known to us is even better than this love on its best day. It’s an eterrnal love we receive and are empowered to share by the power of the Spirit. We can see it when we gather to worship, pray and fellowship, in all of the people the Spirit uses to draw us in, nurture and remind us whose we are. And it’s what moves us to share what Jesus promises each of us-By the power of the Spirit, and through the Spirit, we are claimed and forever connected to the Trinity. We hear “You will never be orphaned. You’ll NEVER walk alone.” We reminded that this promise is ours, as is the opportunity in front of us. This is the real source of hope for a better world. Hold this dear, remember it often and with the help of the Advocate, share your walk with God in your lives so no one walks alone. Rejoice! It's a Bumper Crop! Rejoice with me and with my classmates at LTSG as we graduate tomorrow!! If you've ever gardened, you know that when you plant seeds you don't know what will happen- some will grow, some won't and some will grow but they will not look like the picture. It's part of why it is tempting to just let someone else do that work and buy the already tended plant. But even so, someone had to do the growing. Even when you have the plants you don't know what the garden will look like. 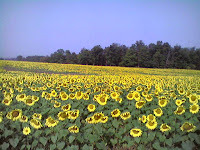 The picture above is from a field on the commute to LTSG- one year the farmer seeded the entire area in sunflowers. I honestly don't think even he expected such a bumper crop. For 43 years people planted and tended the seed in me- I was a slow grower. For my classmates, the growing schedule is as varied as the day is long, but we each have a story that got us here. In May of 2007, I was getting ready to meet with my synod candidacy committee to learn if they would approve my entering seminary. Now here I am in May preparing to graduate four years later having been surrounded by some truly amazing people, and while I always dreamed it would turn out well, it has exceeded expectations. Our class has been that bumper crop! 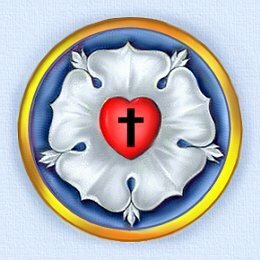 Four years ago I became a “Blogging Lutheran” and met a fellow blogger in the blogosphere who said he was coming to seminary. Later that year we sat across a circle from each other sharing call stories. He later created the web page that kept us all connected on internship. We came from all over the country and right next door. One fellow student came from Alaska, but turned out she originally grew up down the road from my inlaws. and our lives have grown together in many ways. I've met people transformed by outdoor ministry, a few of whom will now work with my daughter this summer at a Lutheran camp. After years of supporting the church’s ministry in Tanzania, I can now say I know a seminarian who's been there and has a passion for that global ministry. And there are some who dared to make the long trek from places like Ethiopia to here to serve the church and open our eyes to new visions. With some of my classmates I have traveled halfway round the world to walk in the footsteps of Paul, literally. I have experienced beautiful music, Easter Peep dioramas, and worship in different languages, Luther Bowl, inspiring preaching, innovative teaching and stinkbugs (the last of these I would be glad to forget). Some were engineers, social workers, bookstore managers, athletic directors, legal types, and many more were the truly risky ones- those who came straight from college. People from many traditions who have deepened our understandings in ways we could not have seen that first August. We all got here by the Spirit because of mentors and experiences that encouraged us to hear and dare to respond to God’s call. For most of us there has been some pruning and tending, and twists and turns but as I look back to four years ago, I can see that what looked like a group of possibilities has grown into a group of people whose sense of call has grown and flourished. So it is for each of us. It is a new beginning for each person leaving here, as we go forth to plant and tend all over God's field. But I hope also for a new beginning of sorts for the church. On the horizon are more budget cuts which will decimate funding for some of the ministries that brought us here- talk to seminarians and many will tell you of how campus ministry, outdoor ministry and youth ministry were fundamental to their sense of call. Likewise funding of seminary education is always at risk while congregations long for leaders. Instead of throwing up our hands saying the scarcity is too large, let's not get discouraged. Cutting these areas is like destroying the seed corn (I heard those words from someone else) – we can’t grow from nothing. While I would admit that God can, I am not sure that this is a test of God we should engage. The plants have to come from somewhere. They come from congregations and synods and the larger church. We all have a critical role together. And if you need proof it's worth it, and you’re on the Ridge this week, or any other seminary, when you’re celebrating, look around and ask what the picture would look like if those seeds had never been planted. They are after all a pretty amazing group that God sprouted. And then together let’s dream of more bumper crops. Yesterday was our Senior Banquet, our way of celebrating the fact that (pending the fulfillment of all academic requirements) we really are going to graduate, but more importantly, saying thanks to all of the faculty, administration and staff who got us to this point. No matter how old we are we have all needed a few "mothering" moments along the way. When I speak of "us" I think about how many children have come into the picture, babies born, little ones growing up. I think of my classmates who are exploring adoption and foster parenting and am amazed. I think of classmates who could not be at our meal because they needed to be with their family. I look around and see how many people have gotten engaged or married since they began seminary. And I think about how over four years we have grown more fully into our callings. And to get to that point it has taken a lot of parenting figures. I give thanks for each person who in the name of Christ has at some time has been there- in the face of friends and in the face of everyone from the person who fixed a problem in the dorm, a billing or finanical aid snafu, server connection issues, course registration conundrums and a myriad of other things. They in addition to our professors have tolerated our confusion, affirmed our discoveries and occasionally dished out a little reality check. Through all of the things that have stretched and shaped us, there is a giant network of people, some very visible and some behind the scenes who have helped to make our "growing years" bear fruit. When Michael and I were married, we were given a piece of cross-stitch that exclaims- “The road is bright before us, as hand in hand we start, united in love forever, one mind, one soul, one heart.” So too at the Seminary, I remember those first days of Summer Greek when we were giddy about launching our paths toward ministry, in those first days before participles, group projects and many other things would challenge our sense of it all. I could tell you that the road of either of these journeys has always been bright and we have always been in solidarity about the journey. Or I could be honest and share that inevitably, disappointments and anxiety about what’s next takes on a life of its own in community. “Some people saw… these people said… others discovered…” We're really quick to share those stories. When we’re on our walk, we can become so focused upon sorting it all out. Where’s God? We went looking, we thought we knew. And now with social media, the concept of flash mob meets doubt in ways that quickly take on epic proportion as we click and comment in the frenetic pace of our need to analyze and know. As I prepare to end my time in seminary, I would love to be able to say that those of us intent on pursuing a closer walk with God were somehow more adept and remembering where to find the Lord. But we all have had those moments when we are sure it is all for naught, when we have no clue what will happen next and how we might as well accept that it is about to turn out badly. From the time we began, we have all had those crisis moments about coursework, or relationships, or when we find out that where we have been sent by God isn’t at all the road we sought out or expected. We have agonized over whether the economy will doom our chances, or whether the currents of dissent in our churches will. How will I survive teaching parish? I can’t take another day of CPE. I can't believe what that (professor, classmate, supervisor) said! Will there be an internship site and will it be what I hope for? Will a bishop choose me, or a congregation? What does it all mean? What if at the end of the road, it’s just the end of the road? But as we kept walking and listening, across those miles, at some point, we took a break from our pace, and took a breath from all of our words. And in those moments, the ones where we sat a spell, Jesus showed up to us, giving us strength for the journey in the midst of the community. In small, but intimate ways. Fleeting ways. And then as soon as we blinked, it’s gone. But we know it has happened- and this is why we have still continued the journey. Here in my house, as we’ve have been going through all of the things we’ve accumulated, in anticipation of perhaps moving in the next year, it takes longer than I’d like to think. Because we get sidetracked with each thing into all of the memories- Has really been that long since…? Remember how crazy that was? What a great day when…All of those memories, burning in our hearts. We cherish where God has been in all of the people who have touched us on the road so far. Because each time we were in doubt, somehow it all turned out. Places where forgiveness seemed impossible, made whole. Perhaps not when or where or how we envisioned, yet we could look back and see where Christ really was. Mark Oldenburg once noted that “on the way to doing the ministry you think you are called to do, something or someone will cross your path and there, real ministry will happen.” That may not be verbatim- but close enough. Those words have always been with me here. I think Luke’s gospel offers a corollary: On the way to looking for Jesus in the places and the people where you are sure he will be found, Jesus will meet you somewhere else and real presence will happen in ways that change you forever. I give thanks to God for all of the times and places where you brought the risen Christ into my awareness. These are the ways that now send me forth to tell others what I have seen and heard in the breaking of bread with you on the path of discernment. And to hopefully do so with eyes at least a little more open to meeting Christ on the journeys to come. I hope it has been so for you and pray it may continue to be so for you. Go forth and be eager to share these stories wherever the road takes you. Are You Willing to be a Rebel for Resurrection Hope? “I have walked through the barren remains of Babylon,” he began. No one can doubt the profound scope of what Hedges has witnessed in his global journeying as a journalist. Anyone who has read even some of his work quickly realizes the gravamen of the accretion of events he confronted as bystander to warfare and aggression, despoiling of environment and seeming callousness of those who are the perpetrators. Amidst the din of this, Hedges began his address with words of Percy Bysshe Shelly- about the feeling of standing amidst the ruin of Egyptian pharaohs: And on the pedestal these words appear: “My name is Ozymandias, King of Kings: Look on my works, ye mighty, and despair!' Nothing beside remains. Round the decay of that colossal wreck, boundless and bare, The lone and level sands stretch far away.” Akin to Ezekiel, Hedges launches into a full tilt assault on the “increasingly rapacious elite” and “a world where ideals no longer correspond to reality, where the frightened retreat into isolated compounds and enclaves of wealth and priviledge. Those in power extract wealth upward with greater ferocity until the hollowed out edifice collapses.” As was the fate of Rome, the Mayans, the Babylonians, so too we see the fate of those in the Middle East, Africa, Europe and ultimately here at home. I full well expected him to say, “Thus says the Lord YHWH.” As the canary in the coal mine protesting more wars, grander monuments, and increasing debts foisted on the backs of the poor, he continued lifting up historic parallels across time of “elitists who become extremists squeezing the last drops out of humanity before they ossify and die, destroying what they claim to be about.” As Hedges offered a summation of sorts for the notion that humans seem destined to be cursed to repeating the cycles of exploitation and collapse at the hands of ignorance and hubris, I found myself writing and underscoring a single word: SIN. I wish I could even remotely approach the skill of writing and oration Hedges possesses yet the word SIN never was uttered. Which is too bad, because he is spot on and that is what it is. We should name it as such. The world we claim to be ever more adept at controlling and engineering like all of those other refined civilizations is still captive to the force of sin. Hold that thought. But back to the church – Hedges tosses more fuel on the fire alleging that the church has forgotten that heretics exist, excoriating evangelicals (and others) for re-connecting with Newt Gingrich and others who “mock the core teachings of Christ” and who “stand by mutely as others betray and exploit the gospel of Christ with bigotry, hatred and greed.” As I was again thinking of Ezekiel taking on those who claimed to speak for YHWH that “all is well when all is not well” he moved in for the kill. “What was the point of ordination is you think you never have to fight for the message of the gospel?” It really doesn’t matter whether Hedges is speaking as one with or without faith, inside or outside the church- these words matter. We serving and aspiring leaders could ask ourselves- what will we risk for the sake of the gospel? I was reminded of the scene in the “Luther” movie when Luther is being cleaned up and prepared for his meeting with officials from Rome. He’s being counseled to back off and hold his tongue. With absolute clarity of purpose he pushes back against this with “when you so boldly sent me out to change the world, did you think there wouldn’t be a cost?” While there’s a point where Hedges’ polemic and I will part company, I cannot quibble with the claim that the longer we are tricked into investing faith in power systems we will be tricked into paths that lead to death-I think I heard this a time or two in Scripture. He speaks of what many would call “kingdom urgency” though never allowing such words to pass his lips. When do we decide we are too busy critiquing our critics or the process to actually take a stand on issues of peace, ecological destruction, injustice? They are in our own backyard. When he says we must be willing to accept the discomfort of action- was it not but a short time ago we wondered if we would deny Christ? Being a rebel means living and telling a story whose narrative is over against all of the other voices. Your strand might look different than mine but in the end the refrain is one that says for Christians that the voice we listen to (or endeavor to listen to) is the voice of a risen Christ. And it’s the voice of God who across time is not bound by the limited narratives of those who seek to co-opt. It’s still a story worth sharing in all the hurting places. It’s a story we cannot share but for a faith that takes more than we have to give. It’s a story we build with others-not as rebels alone. And it’s a story we tell to love because God’s word and not ours is the last and triumphant one that gives us strength to try again. I would never dream to suggest that everything that leads people to hurting places should be just smoothed over. Instead I would love to tell them about a God who offers and calls us to more because of the true and ultimate meaning of resurrection. To Hedges I would say that though nothing erases pain, the other word missing is GRACE- what we need, what we get, what we are called to tell and to live. Each of us. As I got up to leave the chapel I noticed that off to the side was the large wooden cross that had featured writ large in Holy Week, now looking a little left behind- perhaps waiting to be put away. 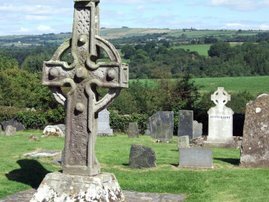 Maybe that’s the point-would we really tire if we looked at the rough hewn cross in the midst of the beautiful chapel, or would we prefer to not be reminded of the cost? Maybe even when we don’t intend to, this subtle actions of ours remind us we have much to contemplate even when it comes from voices beyond our place of sanctuary. Think of how much richer the story we share will be when we do. How Christ's narrative might speak louder than cacaphony of doom. It's risky- Are you willing to be a rebel for resurrection hope in our world?